Egypt's International Cooperation Minister Fayza Abul-Naga announced on Wednesday that Egypt's interim government – headed up by Prime Minister Kamal El-Ganzouri – was set to remain in place until a new cabinet was drawn up. Many members of Egypt’s business community, who admire Ganzouri’s relatively business-friendly attitude, welcomed the news. Appointed last December by Egypt’s Supreme Council of the Armed Forces, the 79-year-old PM has an economic background and is known to be of liberal inclinations. Ganzouri served as Egyptian premier under ousted president Hosni Mubarak from 1996 to 1999. He is therefore well-liked by many local businesspeople, especially those in circles known to have been close to the Mubarak family. "Ganzouri is an economist with considerable experience; he already knows Egypt’s situation quite well," Yousri Qotb, chairman of Egypt’s Universal Industries, told Ahram Online. "I personally hope he remains in office." Sherif El-Gabali, head of the chamber of chemical industries at the Egyptian Federation of Industries, shares Qotb’s view. El-Gabali expressed concern, however, about the temporary nature of the Ganzouri cabinet. "Investors, both local and foreign, won't be able to make long-term decisions because it is only an interim government," he said. Some businessmen, fearing the effects of an Islamist presidency on Egypt’s business environment and the prolongation of political instability, welcomed the news that the Ganzouri government would remain in place – even those who had initially objected to his appointment. "At first I opposed Ganzouri’s appointment last December since it gave the impression that nothing had changed after the revolution," said Mahmoud Omara, who works in the agriculture industry. "But now I hope he will stay in the post until a new constitution can be written and a new parliament elected." Omara went on to justify his assertions by pointing to what he described as the "weak parliamentary performance" of the Muslim Brotherhood before the SCAF’s abrupt decision to dissolve the People’s Assembly (the lower house of Egypt’s parliament) – almost half the seats of which had been held by the Brotherhood – last month. "I had expected the Brotherhood to arrive to power with clear ideas about how to manage the country, but they don’t appear to have any," he said. Brotherhood candidate Mohamed Morsi was elected to the presidency last month on promises to ease Egypt’s chronic problems – including an ongoing security vacuum, traffic congestion, bread shortages, inadequate public sanitation and energy shortfalls – within his first 100 days in office. Abul-Naga's statements came shortly after Morsi had met with the interim government to discuss implementation of his 100-day programme. 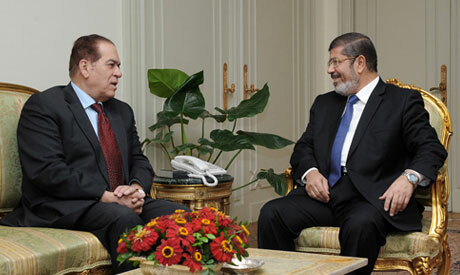 Some media reports speculated that, during the meeting, Morsi had asked Ganzouri and his cabinet to stay put. Deadlines for the appointment of new government ministers have been issued several times, only to be subsequently postponed. The last such deadline expired on Tuesday. Morsi had earlier declared that he did not want to make any "hasty decisions" when making new government appointments.